The Pyramid project is located within the Quesnel Terrane which is known to host Cu-Au porphyry deposits. At a regional scale, the Quesnel Terrane is an island arc environment analogous to the modern day Philippines. The regional geology consists of Takla Group volcanosedimentary rocks that have been intruded by multiple phases of dioritic rocks. The property geology is reflective of the regional geology with Takla Group marine sedimentary and volcanic rocks that have been intruded by several phases of Late Triassic-Early Jurassic diorites and quartz diorites. The most advanced zone on the property (MT Zone) consists of two phases of diorites. Mineralization occurs in both the porphyritic and megacrystic phases. Alteration on the property mostly represents a distal porphyry environment with propylitic alteration. Stronger and more proximal silica alteration is widespread around zones of mineralization. The West Zone contains a large area (1km x 3km) of disseminated low grade chalcopyrite mineralization. The background porphyry event is likely responsible for the widespread disseminated chalcopyrite on Chicken’s Neck Mountain. It appears that an early porphyry event occurred on the property where a large area was mineralized at sub economic grades. This event is also likely responsible for the widespread anomalous copper in soils at Chicken’s Neck Mountain. A later porphyry event appears to have taken place with the introduction of cross cutting intrusives found in the south west of the West Zone. This event does not have a surficial expression and requires future drill testing to determine its extent and grade. The most recent hydrothermal event at the West Zone is the formation of an epithermal vein system which is likely responsible for the majority of the gold in the area. Prior to 2017, OK2 geologists were focused on defining porphyry prospects and hadn’t fully evaluated the epithermal potential of the zone. Mineralization is open ended at depth as well as in all directions. 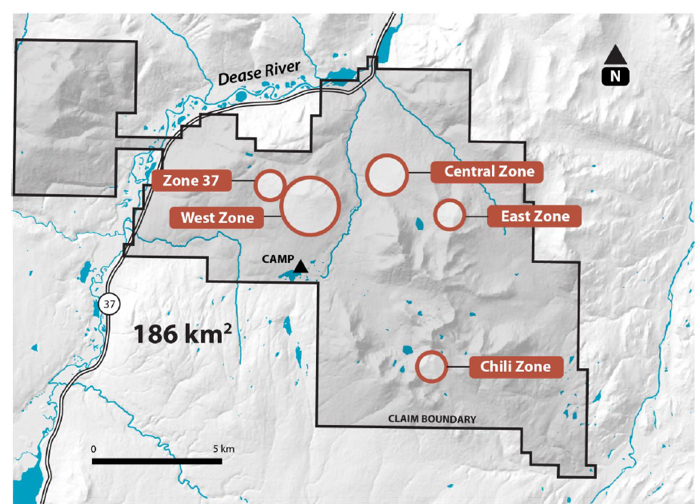 The target is of significant interest because the relatively under explored north side of Chicken’s Neck Mountain wasn’t considered for drilling due to the absence of widespread disseminated mineralization and the original porphyry model. This area contains some of the strongest gold in soil anomalies on the property and given the new epithermal interpretation it is highly prospective.